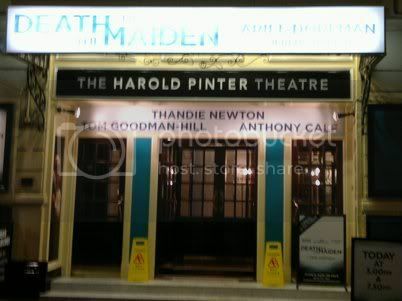 After 130 years with a name that rarely reflected the actual play being shown, the Comedy Theatre has finally had its long-rumoured name change to the Harold Pinter Theatre. The first production under the new banner is a 1990 play that was, appropriately enough, originally dedicated to Pinter and deals with the same subject matter - torture in Pinochet's Chile - as One for the Road. Ariel Dorfman's Death and the Maiden takes place as Pinochet's regime is on the way out but there's still fears that the military dictatorship could return. Lawyer and aspiring politician Gerardo (Tom Goodman-Hill) has been appointed to a committee investigating past human rights violations, but he and his wife Paulina (Thandie Newton) have never reported the fact that she herself was abducted and tortured for two months, 15 years earlier. When Gerardo gets a flat tyre, he's given a lift home by Roberto (Anthony Calf.) Thinking she recognises the voice of her torturer, Paulina ties their visitor to a chair and demands a confession. There's certainly a lot that's powerful and still relevant about the play, even if some of the dialogue's clunky, and the psychology of the characters didn't always convince me (the reasoning behind Paulina never having told her husband the full extent of what was done to her, and consequently having made no progress moving on in 15 years, is pretty weak.) And I was certainly interested to see how the story would pan out. But Jeremy Herrin's production feels underpowered, and unfortunately I think Newton (a familiar face on screen but making her West End debut, with no other stage work listed in her bio) is largely to blame. Neither Richard nor I found her remotely convincing as a damaged torture victim (nor did much of the audience, judging from overheard conversations on the way out.) As a result the show engages intellectually but not emotionally.